This Crockpot Breakfast Casserole is a delicious make-ahead breakfast option for meal prep or for big family gatherings. Dump frozen hash browns, bacon, eggs and veggies in the slow cooker – it's so easy! 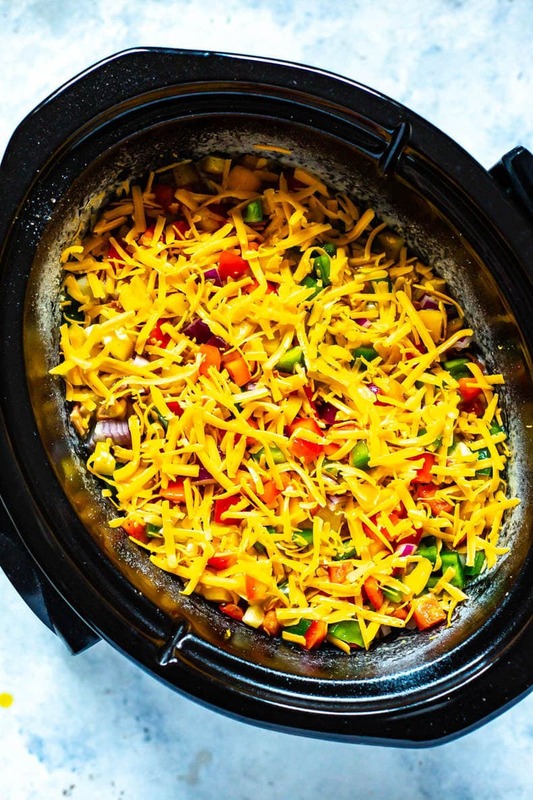 So the slow cooker is pretty much the best thing to ever happen to your meal prep routine. Seriously. You can leave it in for a few hours while you run out and do other errands, and the cooking time is basically hands off. 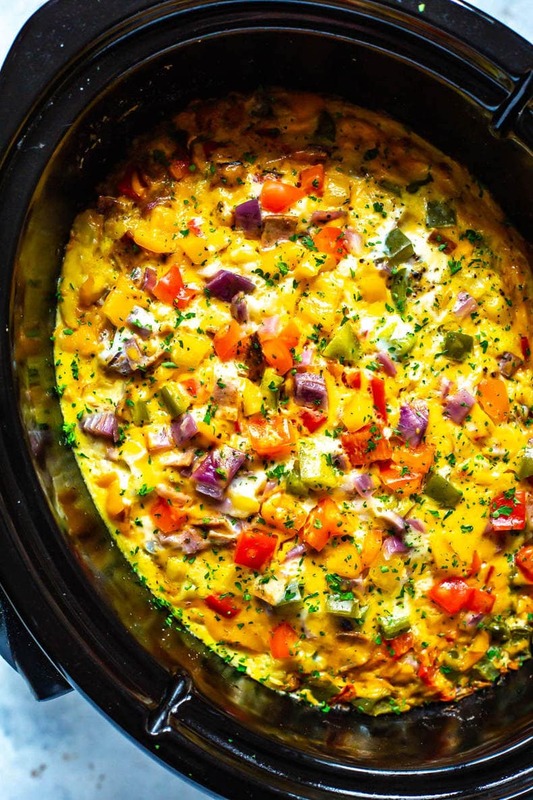 This crockpot breakfast casserole is genius for your weekly meal prep (literally just dump everything in and press the on button), but it's also perfect for big family gatherings like Christmas where you're looking to serve a big breakfast. Pair this breakfast casserole with a fruit tray and you're feeding 8 people easily! 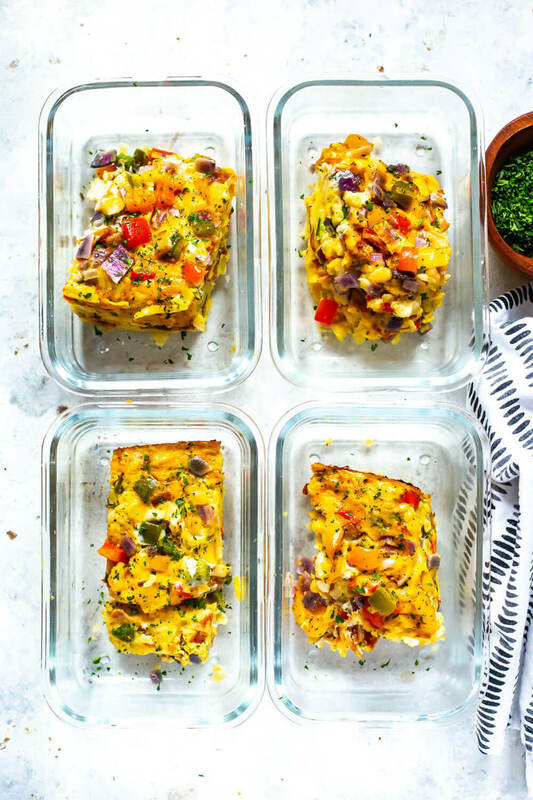 If you love eggs and breakfast casseroles but you want something a little lighter and lower in calories, then you'll probably also love this Egg White Frittata – it's low carb and loaded with veggies so it's perfect for those upcoming New Year's resolutions. 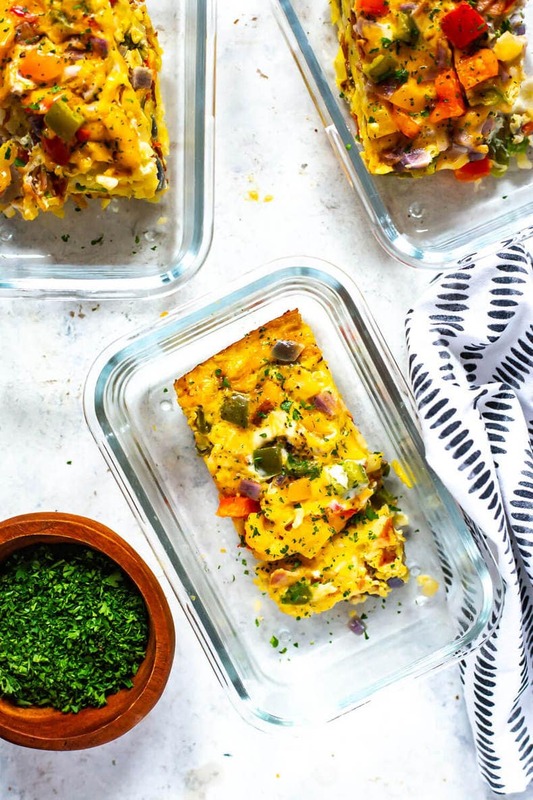 And like this breakfast casserole, it's just as easy to make and will save you loads of time getting ready in the morning. Isn't that the great part about a grab and go breakfast? You literally don't have to worry about what you're going to eat in the morning and you can also take it with you to go so you can eat it at work, instead of wolfing down some food first thing in the morning before you're even hungry. The great thing about this crockpot breakfast casserole is that you can put just about anything in it! Because I'm obsessed with hash browns they had to make an appearance – I just used the frozen diced breakfast potatoes that McCain makes but you could layer in some tater tots or shredded frozen potatoes too. From there, you'll pile in the veggies and your protein. Cooked up breakfast sausage works as well as turkey bacon or regular pork bacon. You can even get creative and use up some leftover meat if you have any in the fridge. Leftover ham, for instance would work well, or even some deli turkey, salami or ham would taste amazing. I just used some diced up bell peppers and red onion and then added in some cheddar cheese to top it all off but even the cheese is optional! If you're really in a bind you can just throw some spinach in there too and skip the other veg. Don't be afraid to mix it up! This Crockpot Breakfast Casserole is SO simple to make! You can technically even make it in the oven too – like you would in the slow cooker, spray an oven-safe dish with cooking spray and then layer in all your ingredients. Pour the eggs and cheese overtop, then bake! If you're going to bake this breakfast casserole, make sure you preheat the oven to 350 F and cook for 45 min to 1 hour. Otherwise, let the crockpot do all the work! All you need to worry about ahead of time is prepping your protein, so fry up your bacon or sausage and dump it in with the rest of the ingredients. I sometimes cook the meat a day or two before so it's easy to just cook everything when it's time. 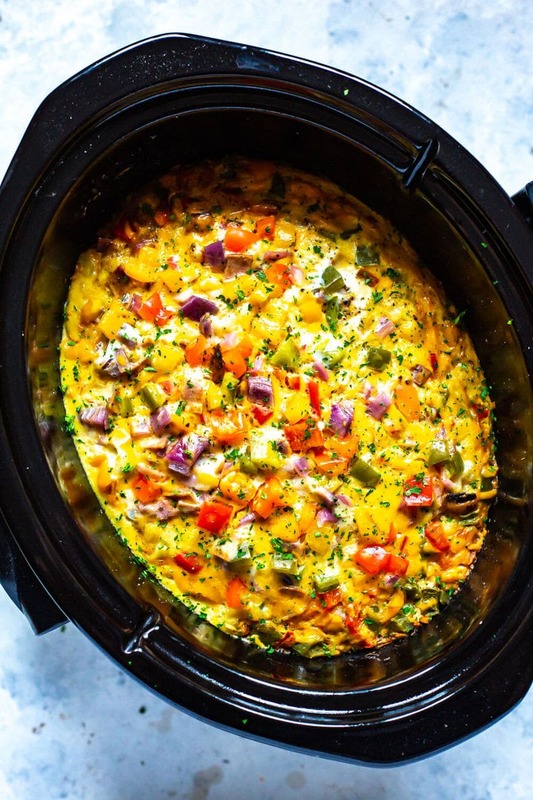 Part of what I love about this slow cooker breakfast casserole is that you can make it a few days in advance. If you're celebrating something special and want to have everything cooked before guests arrive, you can have this breakfast casserole going a few days before. 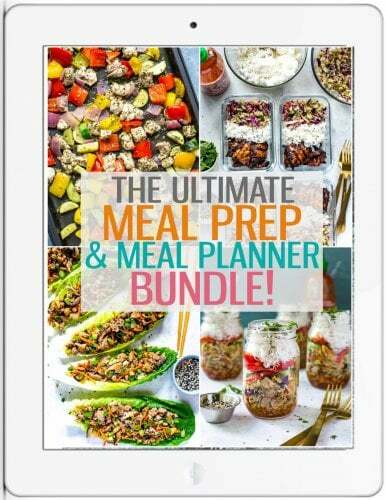 And it will last in the fridge up to 5 days so it's also perfect for your weekly meal prep. 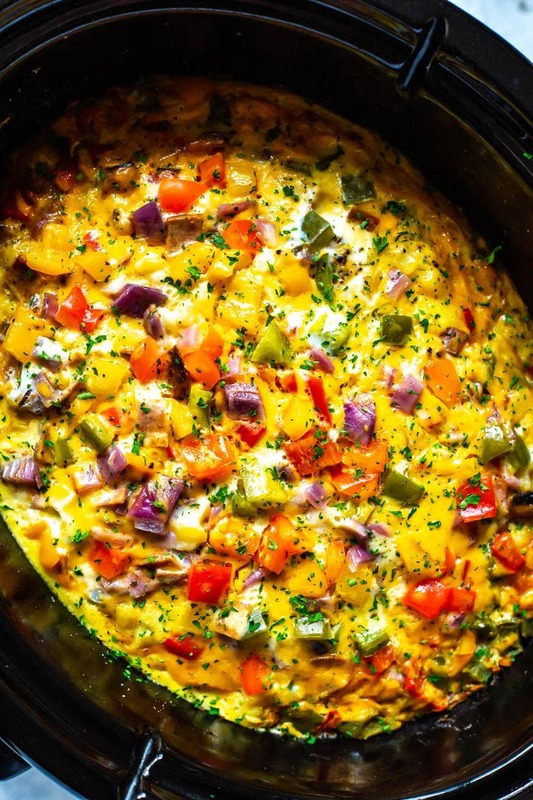 If you are going to be entertaining and want this crockpot breakfast casserole to be ready fresh, you can plan the timing accordingly so it finishes up just as everyone arrives. If you have a brunch around noon or 1pm for instance, you can cook this breakfast casserole on high for 4 hours so you will have time in the morning to get everything together. Don't you just love make ahead recipes? 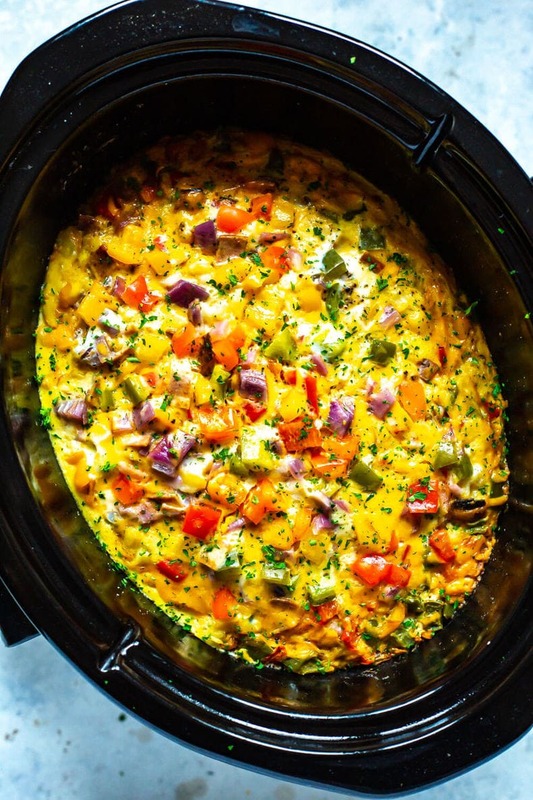 Will you be making this Crockpot Breakfast Casserole? It's seriously so perfect as a make ahead brunch recipe and you'll just gobble it up when you make it as your weekly breakfast meal prep too! 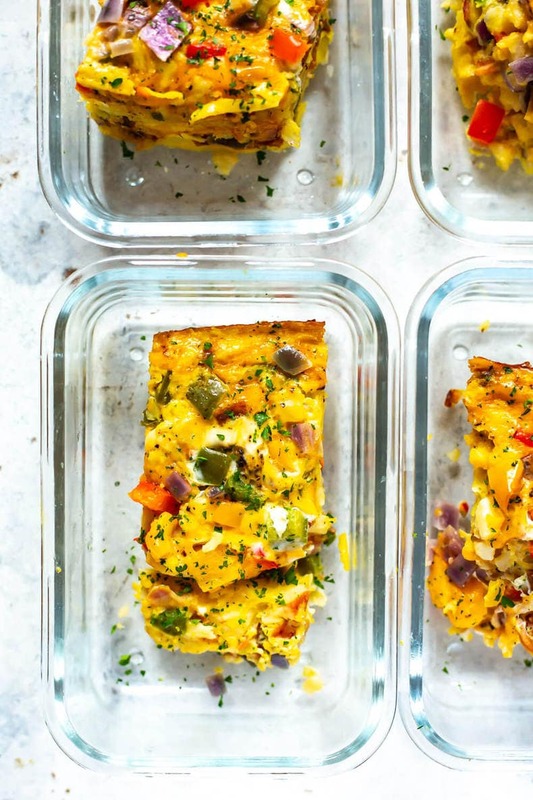 Grab some glass meal prep bowls if you plan on packing this Breakfast Casserole up for your breakfast meal prep. 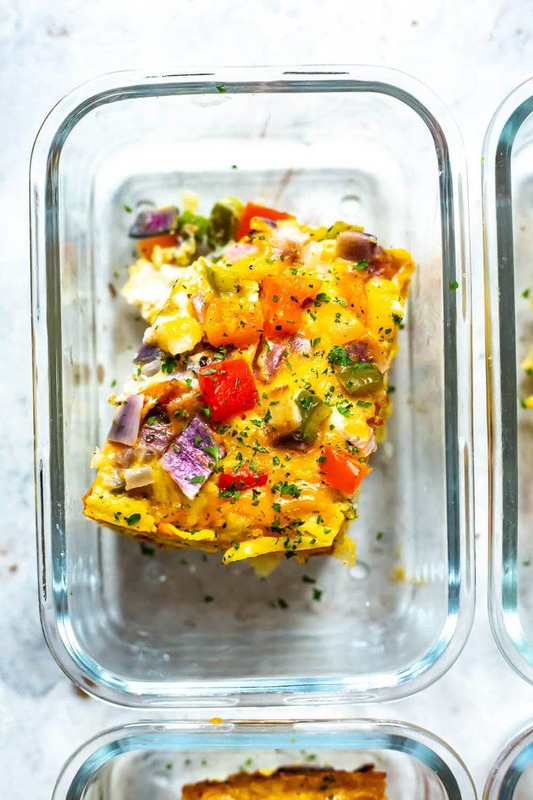 This Crockpot Breakfast Casserole is a delicious make-ahead breakfast option for meal prep or for big family gatherings. Dump frozen hash browns, bacon, eggs and veggies in the slow cooker - it's so easy! Cook bacon over med-high heat in a large skillet, about 5-10 minutes until cooked through (timing will depend on type of bacon used). Spray inside of slow cooker with cooking spray, then add frozen hashbrowns, cooked bacon, peppers and onion in two even layers. Mix salt and pepper with eggs, then pour overtop of other layers and top with cheese. Cook on high for 4 hours or low for 8 hours. Serve and enjoy! Note: This can be made ahead of time up to 3 days in advance. This casserole looks delicious! What size slow cooker did you use to cook it in? Thanks so much Cindy! 🙂 I used an 8 quart slow cooker! I need to feed 30 people breakfast. How many crockpots would you need? Hey Janice – this recipe has 8 servings so you would probably need 4 crockpots to pull that off – good luck!! 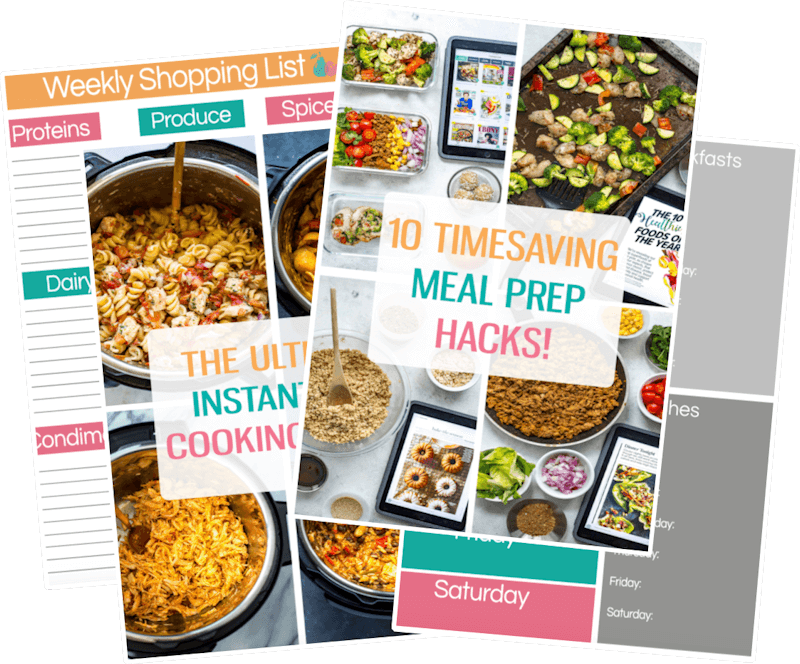 I make a lot of your instant pot recipes, they’ve all been awesome. Wondering if this could be done in the instant pot? I haven’t tried converting a slow cooker recipe yet and my crockpot broke! Aww thanks Erin!! Honestly I wouldn’t recommend it with this one. I’ve never tried making eggs like this in the Instant Pot and don’t know how it would translate.